Learn everything you need to know about your 26 week old baby. Track important developments and milestones such as talking, walking, growth, memory & more. Between 6 and 12 months, your baby gets physical, focusing on the gross motor skills he needs for crawling, cruising, walking, and tossing a ball. You can get him going by placing him belly-down on the floor (more tummy time!) and putting his favorite toys just out of reach. With you cheering him on, and with his stuffed bear tantalizingly close by, he might be motivated enough to take a few creeps forward. When you're playing together, switch his position often so he uses different muscle groups. For instance, stand him on your lap and let him bounce, place him in a sitting position, or lift him in the air and fly him around like Superman. An exer-saucer or jumper can strengthen your baby's legs by giving him the chance to put more weight on them, but keeping him confined too often can delay crawling. Give him plenty of opportunities to hang out on the floor so he can move when he's ready. 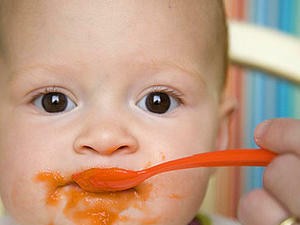 Your baby also continues to hone his fine motor skills these days, developing the dexterity to feed himself with a spoon or pick up tiny objects. 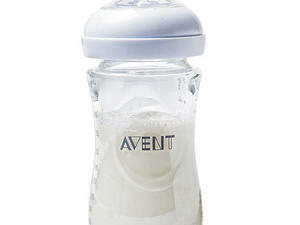 While your baby's grasp is improving, he's better at holding larger objects that he can palm, such as sippy cups. 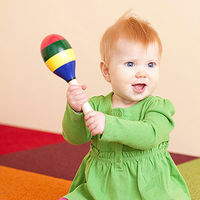 To boost these skills, give your baby activity boards, blocks, balls, stuffed animals, and books -- anything he can use his fingers to twist, squeeze, turn, open, close, poke, or bang. With all this moving around, particularly with the first movement toward crawling, your baby might end up with a few bumps and bruises. Scary, yes, but most owies are no big deal. As you figure how to treat an injury, take your cues from your baby. If he's easily distracted, he might have been more scared than hurt, so try not to fuss over him so much that he gets worried (and tears up again). If a wound looks swollen, wrap an ice pack (a bag of frozen peas works well) in a wash cloth or a towel and apply it to the boo-boo for a few minutes at a time. If it's a small cut, apply an adhesive bandage -- but if it's within his reach, wrap the bandage in cloth, like mittens or a scarf, to keep him from peeling it off and popping it in his mouth, which can be a choking hazard. If you see bleeding that you can't control, or if your baby is inconsolable, call your pediatrician for help. Your baby's probably in the thick of teething and wants to munch constantly, so keep a dedicated basket to house all the stuff your baby can chew on. These toys have a way of vanishing if they're not all kept in one place, leaving you stuck hunting them down while your baby wails. Make sure to clean them too. Toss plastic toys in the top rack of the dishwasher once a week or so; wipe down toys that aren't dishwasher safe with hydrogen peroxide. If you work outside the home, your baby's undoubtedly used to spending time with his caregiver by now. In fact, you might worry sometimes that their relationship is too good. Especially now that your baby is starting to form very tight bonds with the people he spends the most time with, it's natural to fear that he'll prefer her over you. You might even feel a bit jealous that she's the one witnessing all the amazing firsts in your baby's development. But it's actually a good thing that your baby adores his caregiver. The better their relationship, the more attention and affection he's apt to get. And the fact that he likes her so much means there's nothing to worry about -- which leaves you free to focus on your work. At 6 months, your baby can distinguish between caregivers and parents; he's well aware that you are his mommy, and that ultimately you and your partner are the ones who care for him the most. Just like you, he's capable of having a strong attachment to more than one or two people. So relax and try to enjoy the fact that things are going so well. Enhance your baby's cognitive development by giving him easy-to-clean objects with different textures that he can feel and put in his mouth.